A step at a time always brings us closer to achieving a desired goal. The residents of Kibagare village in westlands constituency of Nairobi have long come to trust this expression. Kibagare is a peri-urban area with a population of around 15000 people and approximately 3000 households (westlands constituency website). The settlement was established in 1972 by coffee plantation workers who worked in the colonial farms now known as Loresho estate. As at now most of the village residents are informal workers working as small scale traders and domestic labourers, whereas fewer than 10% of the residents are in fulltime employment. 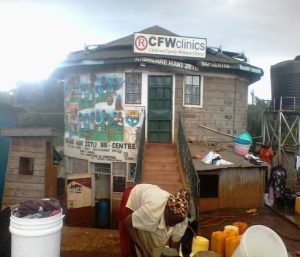 The Kibagare Haki Zetu Savings and Peoples Settlement CBO was established in 2006 and consisted of around 350 members. It started as a self-help group trying to rally together the people of Kibagare to protest against forceful evictions and the group members also saved money in the group. 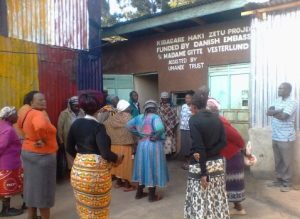 Organisations such as Umande Trust, Haki Jamii, Shelter Forum and Muungano wa Wanavijiji have partnered with the Kibagare Haki Zetu CBO and have initiated several projects and initiatives in Kibagare which have transformed the village for the better. The Kibagare CBO is a well known group in the Kibagare area, and through the partnership of Umande Trust the CBO was able to build a bio-center in 2011. The bio-center has an average of 400 users per day with sales of approxiamately ksh 1500-ksh 2500 per day. As at now the group membership stands at 48 with around 60% of the membership being women. Apart from the bio-centre the CBO also partnered with the Danish embassy, through the facilitation of Umande Trust, and built community ablution blocks as well as a bio-dome. The construction of the bio-dome solved most of the exhaustion and over flow problems experienced in the area as most of the pit latrines in the area are connected to the bio-dome. The bio-centre also provides majority of the residents with clean water as the plots do not have piped water. The bio-centre has an advantage over other water kiosks as they sell their water at ksh 3 whereas most of the kiosks sell at ksh 5. The bio-centre also produces biogas which is mostly used for boiling bathing water. The group members also sometimes use it for cooking meals. The situation before the construction of the bio-centre and ablution blocks in the area was very wanting. 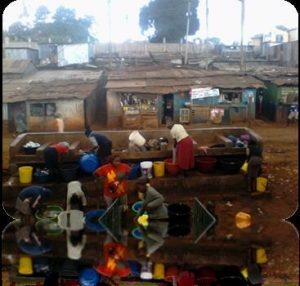 Statistics from the westlands constituency website show that approxiamately around 938 people shared one toilet in the area as there were an estimated 16 toilets only in Kibagare and no bathrooms. This led to high numbers of open defeacation and flying toilets in the area leading to a very unhealthy environment. The construction of the bio-centre has been of great help to the people of Kibagare shining new hope in their lives. The neighbourhood has now improved immensely with almost zero open defeacation and its aesthetic value is slowly being restored. Formation of a savings and credit cooperative (Sacco) with the aim of increasing members’ financial potential (2014). They intend to purchase an acre of land from the money saved. The Kibagare Haki Zetu Savings and Peoples Settlement CBO has had profound effects on the members who stuck on and chose to see through the results of their hard work and sacrifice. The members can now boast of dividends of at least ksh 10000 each and counting, thus giving them something to fall back on when they decide to leave the group. Talking to the current vice chair, Lucy Maina, I got to learn that it has taken much patience and initiative to come this far. Their main principle is that they do not carry any ‘dead weight’ and strive to make sure that all the members are active and well informed of all that is going on in the group. This explains the massive reduction of numbers in the group over the years. They started out as a self-help group, gradually moved to the position of a CBO, and are now registered as a Sacco. Lucy said that to her she feels that they have only made a small dent in a mile long trek towards success and gainful change. services and making the people proactive in issues affecting them. For a people who are mostly self-employed or live on minimum wages the group has changed their lives and if they are able to successfully purchase the land, through the savings in the Sacco it will yet another step taken towards leaving poverty and instability behind.